The 207th Squadron Commander explains the initial process to became a military pilot in the Italian Air Force. During my reportage at the 70th Wing, I had the opportunity to interview the 207th Squadron Commander Lt. Col. Giuseppe Urbano who explained to me the way to become a military pilot. What stage of a pilot's training session is held at the 70th Wing? 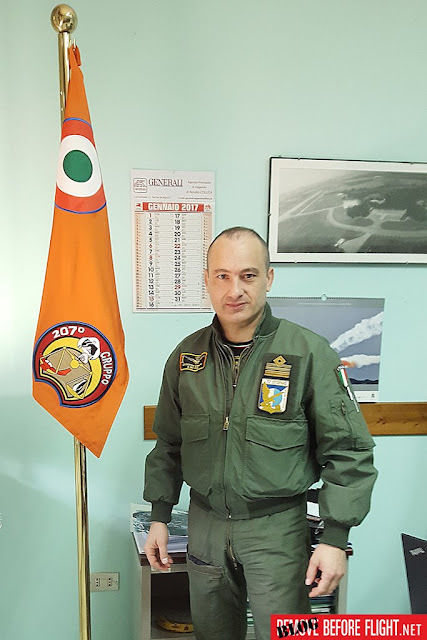 During the selection for the admission to the pilots role, the 70th Wing provides for the assessment of flying ability and the achievement of the Aircraft Pilot Licence (APL) with the Aermacchi T-260B propeller aircraft. Candidates who compete for the pilots role arrive at the 70th Wing after passing the pisco-aptitude training at the Air Force Academy in the penultimate stage of the selection. Here the students perform the latest tests to get the APL. Only in a second phase the pilots will face the challenging training process for achieving the Military Pilot License (MPL). The way to get the MPL is divided into several phases: the 70th Wing carries the Step One with T-260B. This training phase is intended to consolidate the maneuvers already introduced in the previous APL stage and to gain the proper mastery of the aircraft in carrying out acrobatic maneuvers, flight training and simulated emergency management. Which exams must be passed to access the 70th Wing? Currently there are two ways: the first and most common is the one of the Air Force Academy, which is accessed through a selection where, following the overcoming of physical, psycho-attitudinal, general culture and initial training, the 70th Wing is accessed. The second one, less common, is that of the complementary officer, in this case the students do not attend the Air Force Academy, but they must pass military pilot studies. Which aircraft do pilots fly in the next stage? At the end of Phase One, pilots are sent to the Galatina Flight School to fly T-339A or Kalamata (Greece) and Sheppard (USA) to fly T-6 aircraft. What is the instructors update process? Every six months there is a mutual activity between instructors divided into 6 different phases of 2 flights each, which include different flight modes. Through the Pilot Instructor Training (PIT) course conducted by the dedicated Squadron. Do the T-260B instructors also fly other aircraft? They can fly the T-339A and T-2006A. At 70th Wing are pilots of foreign aerial forces and other Italian armed forces trained? Thanks to its high quality and expertise, 70th Wing has become a reference in the military training in Italy and abroad. Currently pilots from Kuwait and Netherlands are trained. Guardia di Finanza and Esercito Italiano also send their students here. How long does the course run at 70th Wing? Recently, the T-2006A aircraft was also acquired, what role does it play? Pilots for multi-engine fleet return to the 70th Wing during Phase Three to obtain the military pilot license fly the Tecnam T-2006A, it is a pre-training that will be completed at the CAE Multicrew in Pratica di Mare AB, Rome. There the pilots will fly with Piaggio P-180A multi-engine aircraft. What is the greatest difficulty for a student in the transition from the theoretical to the practical (physically and psychologically) considering that this is the first flight experience in the Air Force? Among the problems encountered are the ketosis during the first flight experiences and the difficulty in managing a large number of different situations in a short time. Thanks to Lt. Col. Giuseppe Urbano for his precious support.